Draft: 2012, Houston Astros, 4th rd. Graduated from Bishop Amat (CA) HS...Originally selected by the Houston Astros in the fourth round of the 2012 First-Year Player Draft...Signed by Tim Costic. Played in 130 games for Triple-A Gwinnett, leading the Stripers in hits (134), runs (72), and doubles (25)...Recalled twice by the Braves during the season, hitting .083 (1-for-12) with one run scored in 14 games with Atlanta...Recorded a 14-game hitting streak from 6/26-7/12, hitting .371 (23-for-62) during this stretch...Batted .324 (23-for-71) with four doubles, two home runs, 14 runs, and 12 RBI in 21 August games with Gwinnett. Entered the 2017 season ranked by MLB.com as Atlanta's No. 23 prospect and went on to split the campaign between the major league club and Triple-A Gwinnett Braves…Played in a combined 156 games while batting .232 (125-for-538) with 20 home runs and 75 RBI... Hit a career-most 20 combined home runs between Triple-A and the majors (16 MiLB, 4 MLB)... Hit his first career major league home run on 5/20 with a two-out, two-run shot off Washington's Max Scherzer...Became the first Brave to hit his first career home run off a Cy Young award winner since Evan Gattis did so off Roy Halladay on 4/3/2013... Had a pinch-hit single to score the winning run, 6/9 vs. the Mets for his first career gameending RBI...Became the first pinch-hitter for the Braves to collect a game-ending RBI since Juan Francisco did so on 8/17/12 vs. LAD... Opened the season at Gwinnett and hit .262 (37- for-141) with 12 doubles, four home runs and 16 RBI in 37 games before his first recall to Atlanta on 5/18…Batted .175 (14-for-80) over 31 games before being optioned back to GWN on 6/21…His second and final recall came as a part of roster expansion on 9/1…He hit .214 (15-for-70) over 22 games through the end of the season... Played in 103 games over two separate stints (4/6-5, 6/22-8/31) in his second season with Gwinnett...Batted .247 (96-for-388) with 25 doubles, a MiLB career-best 16 HR and 56 RBI in 103 games... Earned Gwinnett's team award as the G-Braves Most Competitive Player for the 2017 season... Led the G-Braves in doubles (25), home runs (career-high 16, fifth-most in Braves' MiLB system) and RBI (56), ranked second in total bases (173) and slugging percentage (.446)... Hit the lone game-ending home run by a G-Brave in 2017 on 4/29 vs. Pawtucket (Game 2 at McCoy Stadium) with a two-run shot off RHP Chandler Shepherd for a 3-1 win. Returned to GWN on 6/21 and batted .239 (59- for-247) with 26 extra-base hits, 40 RBI and 33 runs scored over 66 games through 8/31…Did post a .301 (25-for-83) average through his first 21 games, 6/23-7/16, upon returning to Triple-A... Notched a pair of two-homer games with GWN, 7/9 vs. Indianapolis and 8/17 at Scranton/WB... Posted a .975 fielding percentage (six errors in 238 total chances) in 96 games with GWN… Included 91 games at third base and five as the first baseman. Played in a career-high 133 games in his fifth professional campaign and his first season played at the Triple-A level…Made his first appearance on a Major League roster following an end-of-the season call-up to the majors on 9/17...Had his contract selected on 9/17 and made his Major League debut on 9/18 when he was announced as a pinch-hitter in the seventh inning…Did not register an official at-bat due to the game being called following a second rain delay...Had his first official MLB at-bat as a pinch hitter on 9/24 at MIA (pop out to third base)…Collected his first Major League hit on 9/28 vs. PHI with a triple in the eighth inning…Drove in his first two career RBI with a two-RBI single in the eighth inning on 9/29 vs. PHI...In five games with the Braves, batted .286 (2-for-7) with one triple, two RBI and one stolen base... Named the 2016 Gwinnett Braves Player of the Year by the Atlanta organization…Led the club in hits (126), doubles (24), RBI (62), total bases (186), at-bats (465), slugging percentage (.400) and OPS (.755)…Ranked tied for second in home runs (10), and was third in batting average (.271), runs scored (52) and on-base percentage (.355)... Batted .271 (126-for-465) with 24 doubles, 10 home runs and 62 RBI in 133 games played with Gwinnett...Had the fourth-most RBI (62) among Braves farmhands…Ranked second in walks (61) and tied for seventh in home runs (10)...Named Gwinnett's Player of the Month for April after batting .310 (26-for-84) with two home runs, 13 runs scored and 10 RBI in 23 games...Ranked among International League leaders in games (T3rd, 133) and walks (T5th, 61)... Recorded a season-best 11-game hitting streak, 6/16-26…Batted .378 (17-for-45) during the run...Had a 17-game on-base streak from 6/9-6/27 (.339, 21-for-62, 2B, HR, 4 RBI)...Tallied his first career multi-homer game on 8/20 vs. Rochester …Finished the night 3-for-3 with a solo blast, a three-run homer and one triple and four RBI...Had a season high five RBI on 8/25 vs. Buffalo…Had a three-run double and a two-run home run...Played in eight Governors' Cup playoff games and batted .045 (1-for-22) with one double and one run scored...Entered the 2016 campaign ranked by Baseball America as Atlanta's 19th-best prospect. December 10, 2018 Baltimore Orioles claimed 3B Rio Ruiz off waivers from Atlanta Braves. September 10, 2018 Atlanta Braves recalled 3B Rio Ruiz from Gwinnett Stripers. August 30, 2018 Atlanta Braves optioned 3B Rio Ruiz to Gwinnett Stripers. August 26, 2018 Atlanta Braves recalled Rio Ruiz from Gwinnett Stripers. March 28, 2018 Atlanta Braves optioned 3B Rio Ruiz to Gwinnett Stripers. September 1, 2017 Atlanta Braves recalled Rio Ruiz from Gwinnett Braves. June 22, 2017 Atlanta Braves optioned 3B Rio Ruiz to Gwinnett Braves. May 18, 2017 Atlanta Braves recalled Rio Ruiz from Gwinnett Braves. April 2, 2017 Atlanta Braves optioned 3B Rio Ruiz to Gwinnett Braves. September 17, 2016 Atlanta Braves selected the contract of 3B Rio Ruiz from Gwinnett Braves. April 2, 2016 3B Rio Ruiz assigned to Gwinnett Braves from Mississippi Braves. January 7, 2016 Atlanta Braves invited non-roster 3B Rio Ruiz to spring training. April 6, 2015 3B Rio Ruiz assigned to Mississippi Braves. 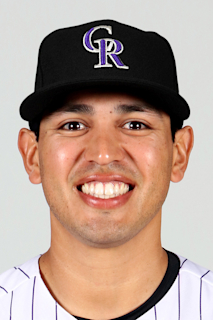 February 3, 2015 Atlanta Braves invited non-roster 3B Rio Ruiz to spring training. April 2, 2014 3B Rio Ruiz assigned to Lancaster JetHawks from Quad Cities River Bandits. March 8, 2014 3B Rio Ruiz assigned to Houston Astros. August 5, 2013 Quad Cities River Bandits activated 3B Rio Ruiz from the temporarily inactive list. August 2, 2013 Quad Cities River Bandits placed 3B Rio Ruiz on the temporarily inactive list. May 9, 2013 Quad Cities River Bandits activated 3B Rio Ruiz from the 7-day disabled list. April 30, 2013 Quad Cities River Bandits placed 3B Rio Ruiz on the 7-day disabled list retroactive to April 29, 2013. April 1, 2013 3B Rio Ruiz assigned to Quad Cities River Bandits from Greeneville Astros. August 11, 2012 Rio Ruiz assigned to Greeneville Astros from GCL Astros. June 28, 2012 Rio Ruiz assigned to GCL Astros from Houston Astros. June 25, 2012 Houston Astros signed 3B Rio Ruiz.